The new search allows you to search for queries such as “friends who like Game of Thrones and microwave Popcorn in California” to allow you to set up a viewing party. Facebook itself doesn’t consider it a ‘search’ product – since it leaves most of the standard searching to Bing. In fact executives tried hard to come up with a name for the service that didn’t include the word ‘search’ but were ultimately unable to do so. Generally search engines work best when you use broad-level queries to cast the widest possible net. Graph search, however, benefits from you being as narrow, and adding as many criteria to your search field as possible. Advertizers can already target you by your age, region, gender, and interests. 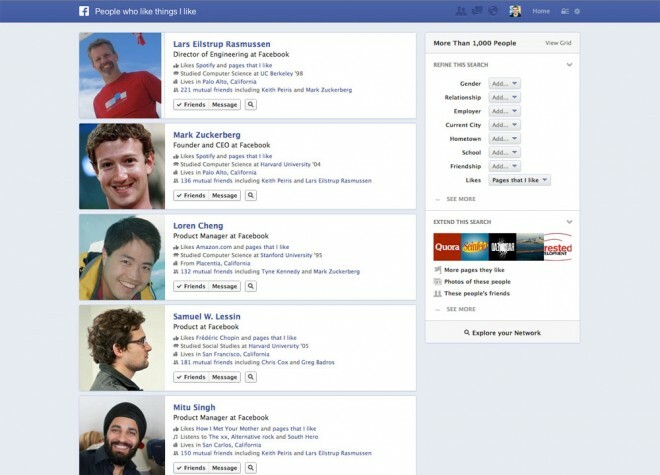 Facebook is simply making this – and other – information available to users. The initial launch will be limited. It will only be available in English and won’t be useable through smartphone apps. Read more about what this new search can do, why LinkedIn should be scared, and some of the privacy issues involved over here. ← Are Scrabble Tiles Incorrectly Valued?